Pet Parents is a company made up of Pet Parents just like you. We strive to create products that make our pets happy & in addition make yours happy as well. All of our products are given to our pets before production so we know they will hold up to actual use by your pets. Because of this, all of our products are backed by a 100% money-back guarantee. There is a reason they're called Gnawtlers®. To begin with, our elk antlers are specially selected from Grade A premium raw elk antler for their weight, density, color, & shape. From there, they are meticulously sorted, weighed, cut, sanded, vacuum sealed, & labeled becoming Gnawtlers. Our pieces are scrutinized from their original raw form laying on the forest ground all the way to your home & your pup to ensure your Gnawtler is up to Gnawtler standards. The marrow on the inside of our elk antler chews are packed with calcium, phosphorus, manganese & zinc, they provide a delicious treat that strengthens your pup without all the calories & digestive issues associated with other options like raw hides & processed treats. Unlike other processed & dyed options, Gnawtlers have no odor, no mess, & even after hours & hours of gnawing won't leave residue or coloring behind making them perfect dog toys for aggressive chewers. Why Are Naturally Shed Antlers Important? At Pet Parents we love animals, not just the ones in our homes. Because of this our raw elks antlers only come from antlers that have naturally fallen from elk. This guarantees nature's natural dog bones & perfect bone marrow dog treats for years to come! Get your Pet Parents Gnawtlers today! USA ELK ANTLERS FOR DOGS MEDIUM is sized for Dogs 20-40lbs, such as a Beagle, Bulldog, and Dachshund. The length of the Medium Gnawtler elk antlers is 4.5" - 5". The medium dog bone is a good choice for dog toys for aggressive chewers & natural dog bones for the medium guys that need something to gnaw on besides your furniture, shoes or house. Medium Gnawtlers are great for large size dogs when they are teething puppies! ALL NATURAL, HEALTHY & CLEAN TREAT - Our premium elk antlers dogs are packed with calcium, phosphorus, manganese & zinc making them perfect bone marrow dog treats. 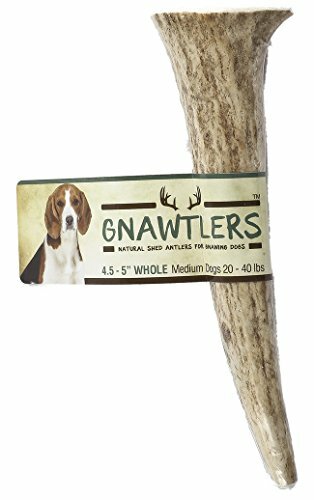 Unlike other processed & dyed options, Gnawtlers elk antler chews have no odor, no mess, & even after hours & hours of gnawing won't leave residue or coloring behind making them great for indoors & outdoors! Gnawtlers are also great for dental hygiene as the gnawing removes the build up of plaque found often with small & medium dogs. CALLED GNAWTLERS FOR A REASON - To begin with, our elk antlers are specially selected from Grade A premium raw elk antler for their weight, density, color, & shape. From there, they are meticulously sorted, weighed, cut, sanded, inspected, vacuum sealed, & labeled becoming Gnawtlers. Our pieces are scrutinized from their original raw form laying on the forest & mountain ground all the way to your home & your pup to ensure your Gnawtler is up to Gnawtler standards. A PERFECT DOGGY GIFT - Whether it's your pup's birthday, adoption anniversary, Christmas gift or just because they're your furbaby and you love them, a Pet Parents Gnawtler elk antler dog bone makes a perfect gift for your gnawing dog! If you find your dog or puppy chewing on things around the house, tame the beast by giving them a Gnawtler and watch them chill out. In the super rare case your dog isn't going to town on the elk antler, boil it with a chicken or beef broth and watch them go nuts! VACUUM SEALED FOR YOUR DOGS SAFETY - Unlike other elk antlers on the market that are unprotected and may contact contaminants while waiting to be shipped or even during transit, all Gnawtlers are vacuum sealed for your dogs safety. Gnawtlers are natural antlers, shape, weight, density and color will vary, but we assure only the best become Gnawtlers! Don't settle for anything but the Gnawtler Standard, CLICK ADD TO CART and get your Pet Parents Gnawtlers today!